(CBS) Uggie, the scene-stealing Jack Russell terrier from "The Artist," was not forgotten at the Academy Awards on Sunday night. The 10-year-old pooch made it into the acceptance speech given by best director winner Michel Hazanavicius. He acknowledged the canine co-star's acting abilities, but added, "I don't think he understands what I'm saying. He's not THAT good." Later in the evening, the four-legged winner hit the stage when "The Artist" took home the best picture award. 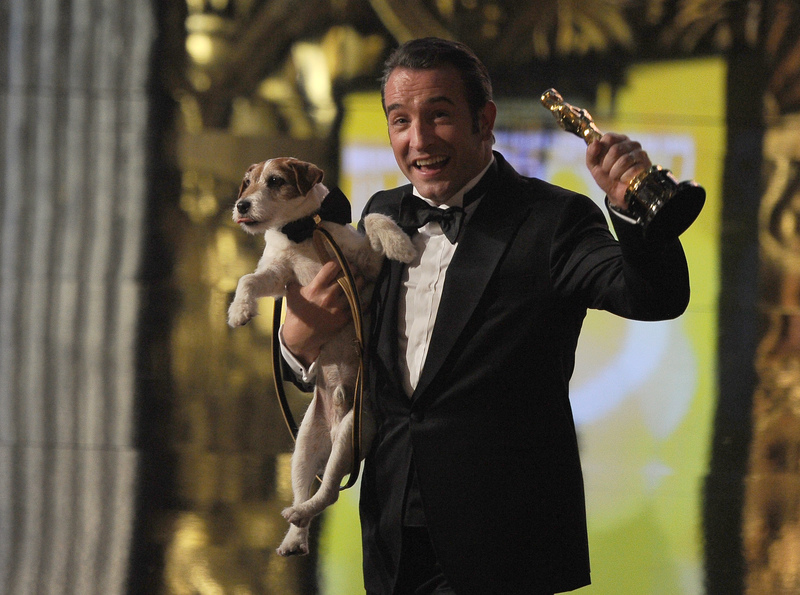 Jean Dujardin, who won the best actor prize for his role in the silent film, was spotted carrying his Oscar in one hand and Uggie in the other. This may be Uggie's first and last Oscar "win." One of his trainers, Sarah Clifford, recently told Reuters that Uggie may not be taking many more major acting gigs. "He is so busy and we don't want to overwork him," she said. "He is 10 years old and close to retirement. He can do little jobs here and there but he probably won't do another feature film, but as far as little commercials and stuff goes, yes. As long as he is still having fun, but we are never going to make the dog do it."